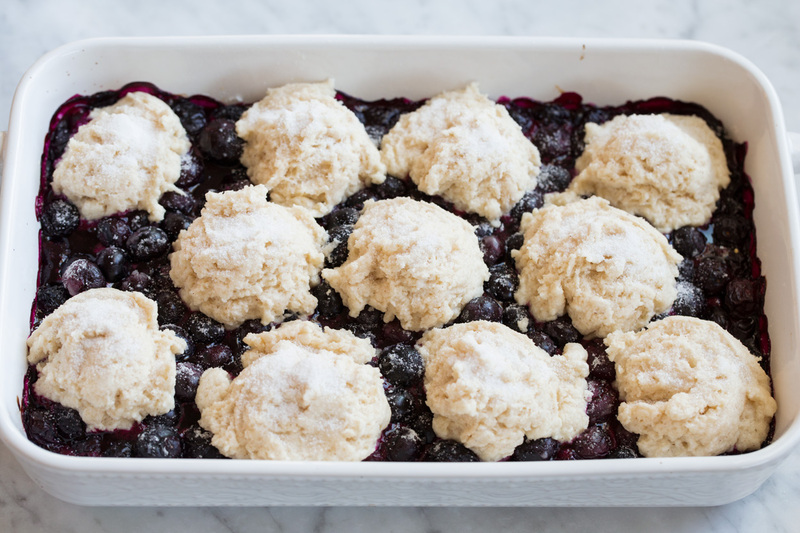 A bowl of warm Blueberry Cobbler is the perfect comfort food on a cold winter day! 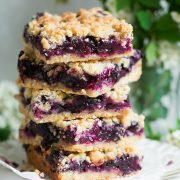 It’s soon to be a favorite dessert with it’s juicy fresh blueberry filling and tender, buttery biscuit topping. Just don’t forget the vanilla ice cream, it’s the perfect finishing touch. The Best Homemade Blueberry Cobbler! 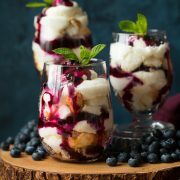 A fresh blueberry dessert in the dead of winter? Yes! I can’t believe how cheap blueberries have been this season and they’ve actually been so sweet too. I normally bake seasonally but when blueberries are $.97 cents a pack you buy alllll the berries. Really though I did get a little carried away (which I always do, blueberries are my favorite fruit). I probably bought 20 packs but I’ve made muffins, pancakes, smoothie bowls, froze some and we’ve been eating them by the handful. And now blueberry cobbler twice! This really is Heaven in a bowl especially with some rich vanilla ice cream. Who can resist that blueberries and cream combo? What Ingredients Go Into Blueberry Cobbler? Fresh blueberries – the highlight of the dessert! Lemon – this brightens up the flavors a little more. 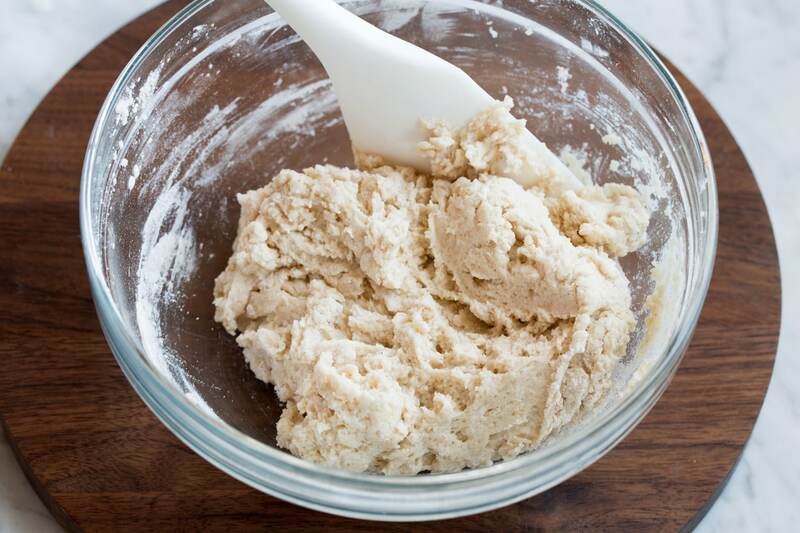 Flour – used here for both thickening and the biscuit topping. Granulated sugar – used to sweeten both the filling and topping. Adjust to taste for the filling if berries are really sweet or tart. Baking powder – this makes the topping nice and fluffy. For best flavor I recommend using aluminum free baking powder. Baking soda – added in addition to baking powder since there’s an acidic ingredient used (buttermilk). Salt – to add flavor. Cinnamon – only a hint is needed here but if you love cinnamon feel free to add more. Butter – what would cobbler be without it? It adds a nice touch of richness. Buttermilk – adds flavor and moistens the biscuits. 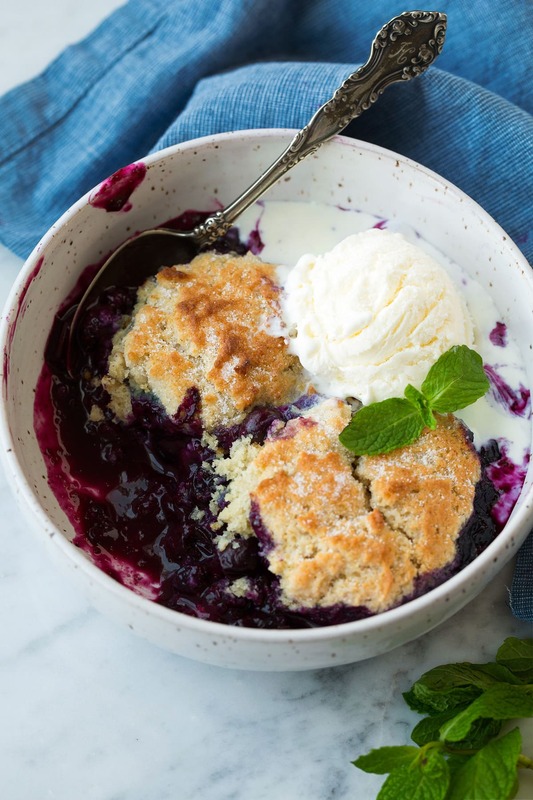 How do You Make Blueberry Cobbler? Add blueberries to a 9 by 9 by 2, or 11 by 7 by 2-inch baking dish, drizzle with lemon juice. In a small bowl whisk 1/4 cup granulated sugar with 1 1/2 Tbsp flour, sprinkle mixture over blueberries and toss blueberries. Bake in preheated oven until filling is hot and edges are bubbling, about 25 minutes. Meanwhile prepare topping. To make topping, in a medium mixing bowl whisk together 1 cup flour, 1/4 cup sugar, baking powder, baking soda, salt and cinnamon, make a well in center. In a separate mixing bowl whisk together buttermilk, butter and vanilla. 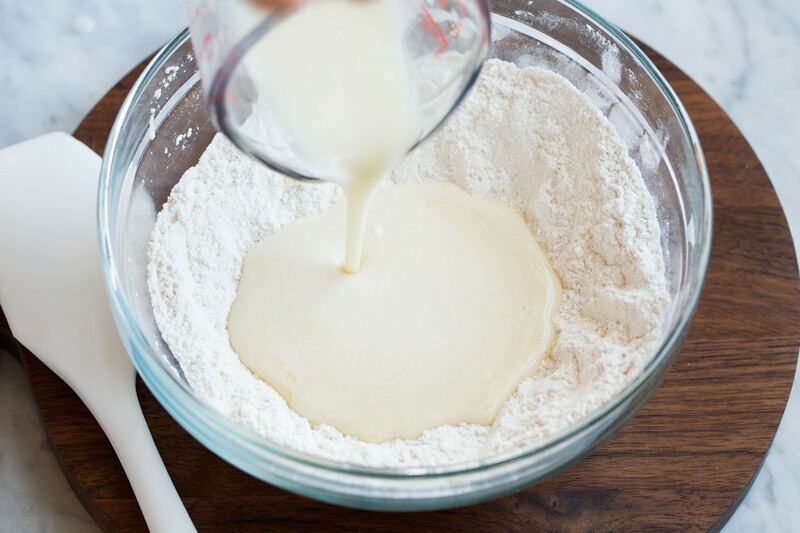 Just a minute or two before you pull the filling from the oven pour buttermilk mixture into flour mixture and fold just until combined and there’s no longer streaks of flour. Remove hot filling from oven, increase oven temperature to 400. Immediately dollop spoonfuls of batter (I used a cookie scoop but two spoons will work) over blueberry filling about the side of a golf ball. Sprinkle dough with sugar then return to oven and bake until filling is bubbling again and biscuits are cooked through, about 12 – 14 minutes. Serve warm with vanilla ice cream. What is the Topping Like? 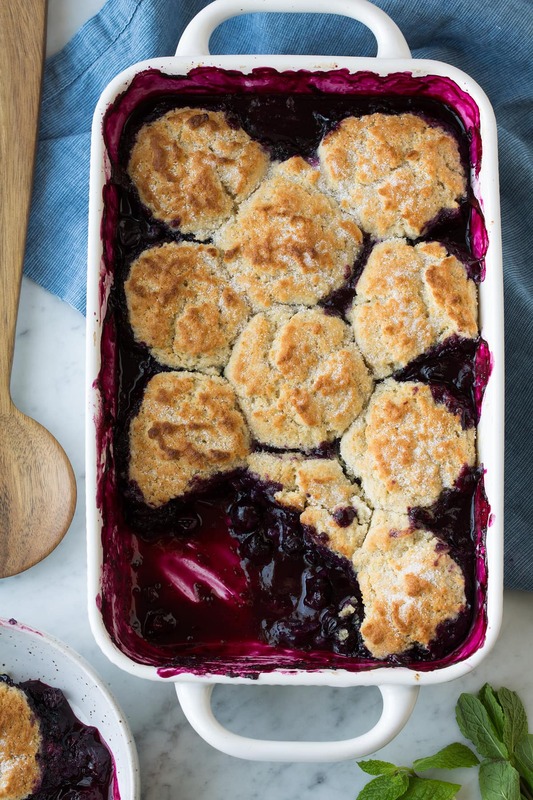 I love this blueberry cobbler because you don’t end up with globby gluey topping. You start by cooking the filling first, then add the dough to the hot blueberry filling so it cooks from the bottom up. The topping is a biscuit-like topping but it’s sweeter and much easier to make than the traditional biscuits. It’s similar to drop biscuits. Frozen blueberries should work well here too. Thaw first and drain. 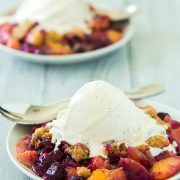 More Delicious Cobblers and Crisps to Try! Preheat oven to 375 degrees. 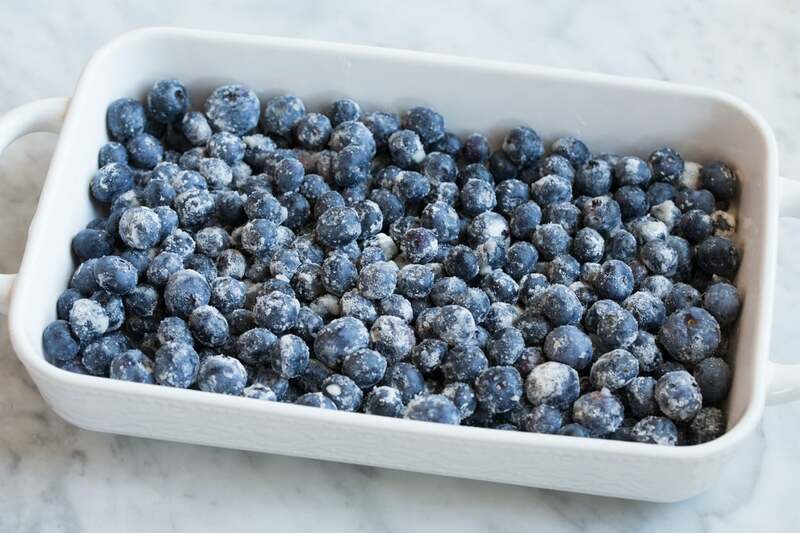 Add blueberries to a 9 by 9 by 2, or 11 by 7 by 2-inch baking dish, drizzle with lemon juice. In a small bowl whisk 1/4 cup granulated sugar with 1 1/2 Tbsp flour, sprinkle mixture over blueberries and toss. Bake in preheated oven until filling is hot and edges are bubbling, about 25 minutes. Meanwhile prepare topping - in a medium mixing bowl whisk together 1 cup flour, 1/4 cup sugar, baking powder, baking soda, salt and cinnamon, make a well in center. In a separate mixing bowl whisk together buttermilk, butter and vanilla. Just a minute before you pull the filling from the oven pour buttermilk mixture into flour mixture and fold just until combined and there's no longer streaks of flour. Remove hot filling from oven, increase oven temperature to 400, and immediately dollop spoonfuls of batter (I used a cookie scoop but two spoons will work) over blueberry filling about the side of a golf balls. Sprinkle sugar over dough then return to oven and bake until filling is bubbling again and biscuit topping is cooked through (it shouldn't be doughy) about 12 - 14 minutes. Serve warm with vanilla ice cream. For further browning you can very briefly broil biscuits near top burner, but don't walk about this should only take 15 - 30 seconds to brown. You can adjust the amount of sugar added to the blueberries based on the sweetness of the batch you have. If they are really sweet you can reduce the sugar added to the berries, if they are very tart you can add a few extra tablespoons. Recipe adapted with changes from Cook’s Illustrated.